Why is it so difficult to be oneself? Every personality test I've ever taken has told me I'm an introvert. My whole life I've thrived on regular doses of solitude. And yet I constantly arm-wrestle my personality. I don't think I should be an introvert. I love people, work with people, why not go all out and do PEOPLE as much as possible? If I can't be "out there" all the time, isn't there something wrong with me? If I'm not keeping a good balance of out-there-ness and inwardness, I get creatively, not physically, exhausted. For the most part I'm pretty okay. I don't even notice anything has happened. But I'm changing that. I'm paying more attention. It's not until I pull back and force the quiet (as I did on a writing retreat last week) that I notice an incredible flood of ideas, output and creative energy. That energy was there all along: but I couldn't access it because I was busy trying to be someone else. Some of us are very good at adapting. We play roles that almost work. And so nobody calls us on it; we aren't challenged to realign our lives with our gifts. We continue along, but aren't quite what we could be. As someone said, "Good is the enemy of best." For others of us, being in the wrong role is obvious, ridiculous, and nobody is fooled. Er, what was this guy thinking? So the next time you're tempted to deny your own limitations and act like you're somebody else, remember that you may actually be cheating yourself. You don't need to change the core of who you are. Really. Your gifts and limitations and you-ness are inextricably bound up with one another. Be yourself, and watch amazing things happen. All right guys. 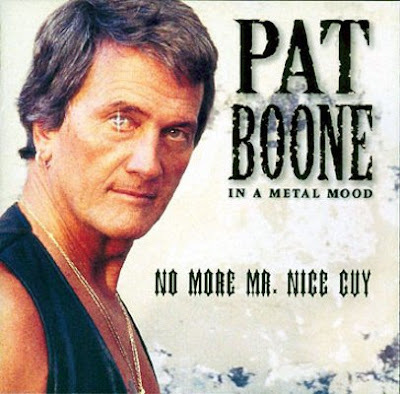 You were supposed to laugh at the Pat Boone pic. I heard nary a chuckle. I did laugh! I graduated high school in 1956 -about as "mid-50's generation as one can get - and was immediately caught up in the Pat Boone (white bucks) and Elvis Presley ("...don't step on my BLUE swede shoes")battle for our hearts and minds. No contest. When I first dropped a nickel in the jukebox and punched "That's Alright, Momma," Elvis became king! And Boone was history. I junked my own white bucks in a matter of days. More. On your topic at large. Being one's self. I turned 72 on August 7 - and I am still trying to sort a life out. All I know for sure is a life-long need to find some order in the chaos of life through drawing and writing and mumbling and wondering - and stumbling forward a day at a time. I am planning a move soon back to my birthplace - Mountain View, Ark - (in the heart of the Ozarks) - and hopefully resume my quest from my beginnings there. Probably take a decade or two. But I am patient. Hopefully I will also get back to blogging then also. It's been almost a year since I checked in. Your post caught my eye today. Thank you. Very much. Thanks for visiting Ralph! And thanks for sharing your hearty chuckle, and your ongoing creative need to find order and affirm your identity. The move to the Ozarks sounds wonderful, and I love your attitude of patience: what a creative person needs most, I expect. All the best to you.